Building your credit from scratch on your post-graduation years is a good idea because it gives you the opportunity to build a solid foundation for your credit history. Here’s how to go about with it. If you are a fresh graduate just stepping into adulthood, it is quite natural for you to yearn to be financially independent. If you are looking at having a source of income during your post-graduation years, you are on the right track indeed. This is also the time when you need to think about getting the basics right as far as your finances are concerned and begin building a credit score. Building your credit from scratch on your post-graduation years is a good idea because it gives you the opportunity to build a solid foundation for your credit history. Here’s how to go about with it. If you are planning to take up higher studies in an institution on domestic shores or abroad, consider getting a student loan instead of making a dent in your parents’ savings. A good CIBIL score that your parents may have maintained will help you obtain a student loan, since you do not have any credit history to show for. Once you have availed of the loan, be frugal with your spending and try and save up as much money as you can during your years as an academic so that you can pay off your student loan with ease at a later date. You may even consider taking up a part time job along with your studies to augment your savings. Once you have completed your education and join a job, try and pay off your student loan as soon as you can. This will not only make you debt free, it will also give you a great start to your CIBIL score. 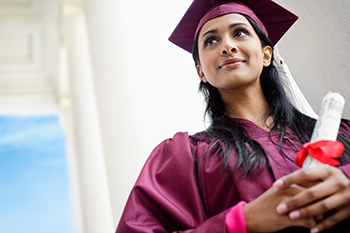 Paying off a student loan ahead of time is akin to making a century in your debut innings and it will put you in good stead with a good CIBIL score when you need to avail of credit later in life. If you are already working part time during your post-graduate years, which is a more or less a necessity these days, consider getting a credit card of your own, instead of using an add on card of a working parent. A credit card when used judiciously is an excellent means to build credit from scratch. However, make sure that you know your limitations and keep your credit limit accordingly so that you do not overspend. Also do not jump for the first credit card that promises to give you an “attractive offer”. Use the services of a web aggregator to check out the various features and benefits that various credit cards offer and compare them on parameters such as rate of interest, annual fee and reward points. By making a fair comparison you will be able to arrive at a card that is best suited to your personal needs. Good financial habits should begin from the time you are able to comprehend money matters and decide that you are old enough to take care of your own money. For instance, if you are using a credit card, make sure you are making timely repayments of your full outstanding amount each billing cycle. Furthermore, get into the habit of beginning to save in small amounts. For instance you can begin an SIP with an amount as small as Rs 500 each month and gradually keep increasing this amount as you begin to increase your income. You must have heard the saying the “early bird catches the worm”, and it cannot be more true to your financial health. So start concentrating on building good credit right from your post graduate years and start saving for a later date. Good financial habits from the very beginning will keep you away from falling prey to a financial crisis even if you were to find yourself in an untoward financial situation later. Ample savings and a good CIBIL score will surely see you through!